"Doctor doctor, will I die?" "Yes my child... and so will I." (anon) It's true for you and me too. Meanwhile, let's find some meaning for ourselves, enjoy the beauty and do things that won't leave a mess for our kids and their kids. 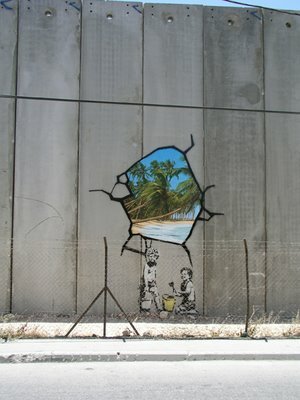 West Bank, Palestine 2005 (yet another Banksy masterpiece - click to see larger). The security barrier separating the occupied territories from Israel is over 450 miles long and 38ft high. It was deemed illegal by the International Court of Justice but construction by the Israeli government continues. That's profound. Such a creative mind. It speaks volumes. That is amazing. Sort of puts it all into perspective, doesn't it? if only they painted it 450 miles long.. Thank you so much for the Haiku brother! It was amazing! 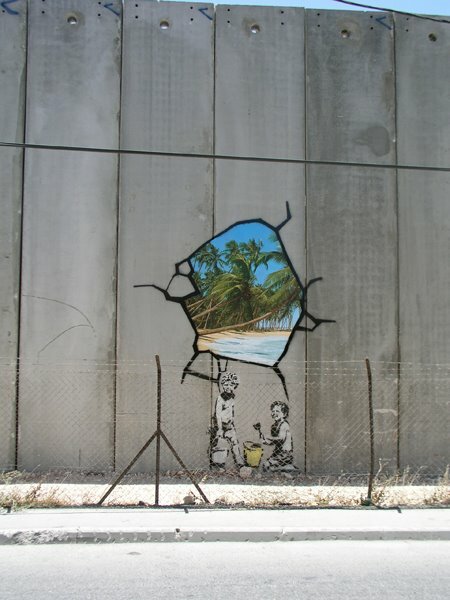 and thank you for sharing Banksy! It is beyond my comprehension that a wall, like the former Berlin wall, is supposed to bring peace and prosperity to humans. Where are the trumpets of Jericho? I live in Nelson BC Canada. I have one lovely Anna, two adult kids (in New York and Montreal), a small house in downtown Nelson, an interesting career as a consultant and lots of other interests, including working for human rights (through Amnesty International and Peace Brigades International mainly).